Don't be put off by the seemingly right-hand only selection, there are some excellent left-handed mice for gaming out there. Walk into a gaming store, or browse gaming mice online, and us left-handed gamers will be met with a barren wasteland. At least in the first instance. As equally as discriminated against on the shop floor as left-handed golfers, us lefties really have a bum deal when it comes to PC equipment, particularly mice. Even after a decent search you'll find out that there's not much for us that's good for us to use, and even less that's made for us. A lot of us left-handers can, of course, quite competently use the right handed normies—partly because we've had no choice but to get used to the stuff built for the masses—but having one that's curved the right way and designed specifically for lefties, is the dream but yet is much like seeing a unicorn. Bar one notable exception. However, there is some recognition of this dearth of options for sinister folk, and, led by the particular exception mentioned (see more below), there are more options on the table now—particularly looking at some of those ambidextrous rodents whose neutral design make them genuinely good options for those of us on the hunt looking for a sinister pointer. I speak from experience and as I too am just a poor lefty, I have persuaded the PC Gamer bigwigs to allow me to write this guide to help others find the best left-handed mouse for gaming, that's the perfect fit for them. This guide will give you a good run down of the best options going and point out some of their pros and cons. 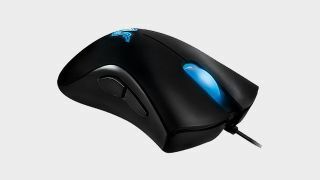 Naturally, you'll need to make sure you're lefty friendly mouse is plugged into an awesome machine, so check out our guide to the best gaming PC, and find the best gaming keyboard to keep it company, and if you want to compare the lefties to the righties, then check out our best gaming mouse list here. This is basically the only true left-handed gaming mouse going, and it does exactly what it says on the tin. This is the one I can personally vouch for after using it for two plus years—for gaming and everyday work use. It’s got all the earmarks of a couple of its right-handed Razer brothers, and is most closely related to the Razer Deathadder Essential. It’s pedigree is undeniable, then. And its has the specs to back it up: 3500 DPI infra-red sensor; five programmable Hyperesponse buttons; 1ms response time; gold plated USB connector; braided cable; among others. It’s probably what could be considered a medium-sized mouse and medium weight, at 0.33 lbs / 148g. It’s genuinely left-handed ergonomic design works brilliantly and has a smooth, comfortable feel. In essence it is just a quality Razer mouse for a particular audience, and I don’t mean that as an insult: it just simply is an excellent left-handed version of an already very good gaming mouse (or perhaps hybridised version of a couple of Razer’s pointers) from one of the best manufacturers in town. Teamed with a great mouse pad your movements will be smooth, while the grip will be secure, and buttons will be satisfying and responsive - it only has five of them but I very quickly found myself using all of them and changing the mouse’s loadout frequently. Basically, it’s worth every penny. It’s not strictly a left-handed mouse, but with its ambidextrous design and as a wireless mouse, it has to be in contention. Starting with the design, it's a really comfortable fit and shape that fits the hand well but also houses removable thumb buttons which can be changed according to the user (should you ever have a right-hander usurp your mouse from you). Said thumb buttons, and the others on the pointer have the best click we’ve ever tested: satisfying to push, feel and hear. On top its metal scroll wheel can click side-to-side and spin freely for 15 seconds—though you can use it as a notched button—and gives a good quality feel. It uses Logitech’s tried and tested (and incredibly accurate) 12,000 CPI sensor, too. It’s quality design feel extends to it feeling sturdy and accident-proof but it comes in quite light despite having to house a battery, weighing only 107 grams. It is a really successful and competent wireless option for lefties that will serve you just as well, if not slightly better, than some wired alternatives. And having said that, you can even plug it in and use it as a wired mouse if you prefer. This will keep you charged and uninterrupted too. This wireless, ambidextrous mouse is the dearest on the list but its such a quality product it’ll be worth at least some time to consider it. It has a tactile, smooth design for all but unlike the Deathadder, it has rubber side grips to help with the positioning and comfort of your hand. All its nine buttons are programmable and have that genuine sense of Razer quality, while underneath the 16,000 DPI sensor is excellent and ensures quality tracking. It’s another medium sized mouse and is also pretty light (111g) for a wireless rodent that has to take batteries with it. The side buttons aren’t detachable so you’ll have to get used to them ‘manually’ but they are well designed enough for you to have good odds of avoiding them by accident as well as using them when you intend too as extra, bonus buttons. A big selling point of this is the alleged 24-hour battery life you’ll get, with the lighting enabled too. Impressive. The wired version, the Lancehead Tournament Edition, is a worthy choice too and a bit cheaper, if you can’t stretch to this one. This is an underrated entry and has benefited from an overhaul of its predecessor and almost all of it is brand new apart from the excellent ambidextrous shape, and that's exactly how it should be. The Sensei’s design is now very grippy, and won’t feel weird if you have hot or sweaty palms, and Steelseries' own custom version is one of the best gaming sensors around, ensuring the 310 won't be lacking in tracking. The shape is wonderfully comfortable and will be great for those looking for a mid-sized pointer for their machine. It has a pair of thumb buttons on both sides, identical in arrangement and placing which would often mean they might well get in the way for either a left- or right-handed user but because of their redesign they are both near enough to be used but just out of the way enough to avoid accidental clicking. Anyone looking for a mid-sized and light option should consider the Sensei 310. This is a fine ambidextrous mouse that offers a great value option. The ROCCAT Kova is accurate and very capable while maintaining a high level of comfort and also features unique Smart Cast buttons that flank each primary button. It has 10 programmable buttons in total and users can map them however they wish (primary and secondary functions available) with ROCCAT’s Easy-Shift+ tech. The weakest part of the Kova is ROCCAT’s software, Swarm. It’s primary purpose is to serve you much like Razer’s Synapse software does, by offering you flexibility and customisation with button layouts. Sensor resolution and LED colors. Unfortunately it's rather convoluted and not as intuitive as the others in the market meaning it can be annoying to work with. Stand out detractors include limited slots for game-specific profiles and confusingly labelled menu options. If you can manage this or just look beyond it—or exert angelic patience and get used to all its idiosyncrasies—however, there’s an excellent ambidextrous, comfortable and well-performing mouse in there that's worthy of lefties’ consideration.